Would you like to qualify as a therapist? In 2015, Melanie also became the 30A Dog Trainer, in addition to the 30A Swim Dog. Since then, she has developed and perfected behavior consulting for the canines we love. She works closely with each and every client and their dogs in order to implement her proven behavioral problem solving process. 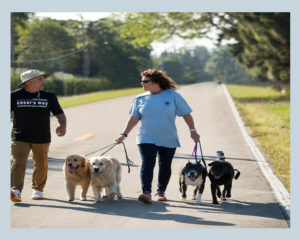 As if you weren’t a believer yet, Melanie had the incredible opportunity to train with Cesar Millan at the Dog Psychology Center in California. She participated in Training Cesar’s Way not once, but twice! She completed Fundamentals 1 in 2016 and Fundamentals 2 in 2017 at Cesar’s Ranch in Santa Clarita, CA. She considered this one of the (many) most amazing experiences in her life. In April 2018, 30A Swim Dog was featured in the premiere episode of Animal PD on Nat Geo Wild. This was a huge recognition showcasing Melanie’s ability in swim rehab. This series is about Alaqua Animal Refuge. In this episode, they bring a dog to Melanie for swim therapy to prepare and strengthen him for heart worm treatment.